Trailside takes its name from the Appalachian Trail that runs through this 25-acre area within Bear Mountain State Park. Overlooking the picturesque Hudson River Valley, Trailside is home to four natural history museums and multiple outdoor habitats for animals that are either permanently injured or orphaned and unable to survive in the wild. 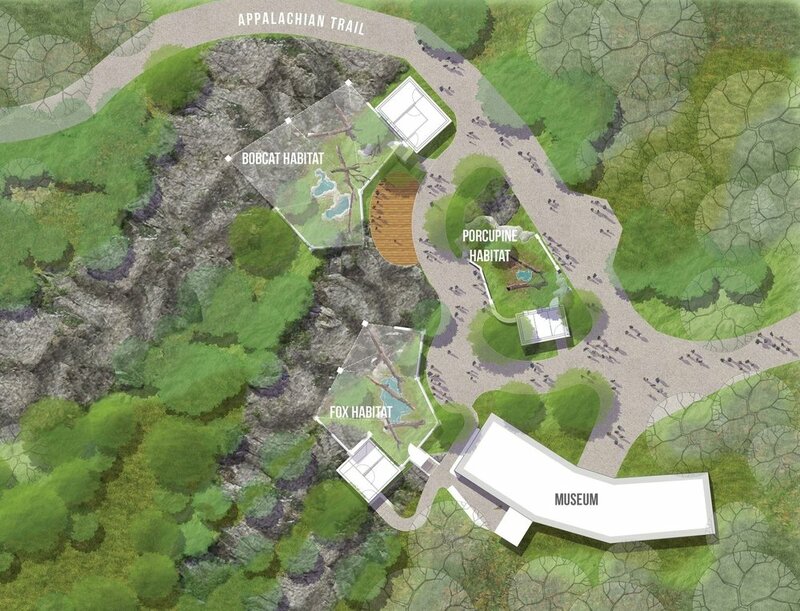 With initial funding through a public grant, the Palisades Park Commission hired Coyle & Caron to re-envision a section of the zoo adjacent to the trail. Menagerie-style cages that line the Trail will be removed opening up long views into a valley and seasonal wetland. A new loop trail diverts visitors from the Trail into an oak forest to observe wildlife in large, transparent mesh enclosures. Habitats for red fox, bobcat and porcupine are designed to incorporate natural features such as large trees and rock outcrops for visual interest and animal enrichment. Each habitat includes a small night house designed in the style of the nearby WPA park buildings and museums. Construction for this project will begin in Winter 2018.